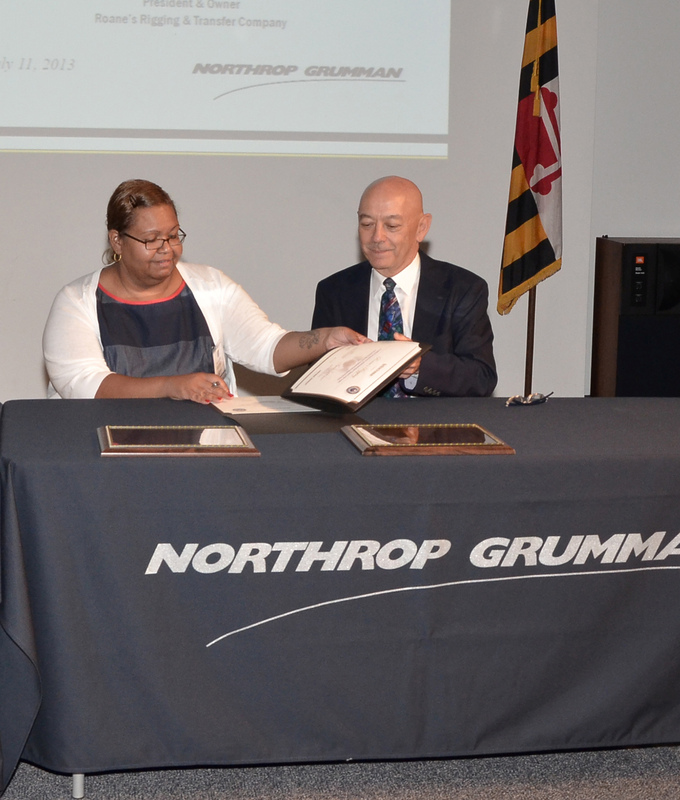 BALTIMORE – July 29, 2013 – Northrop Grumman Corporation (NYSE:NOC) and Roane's Rigging and Transfer Company, Inc. have been approved by the Defense Contracts Management Agency to establish a credit mentor-protégé agreement within the Northrop Grumman Electronic Systems' Comprehensive Small Business Subcontracting Plan. "Northrop Grumman believes strongly in fostering the growth of small businesses that can fill vital roles as suppliers and subcontractors," said Jay Shiba, vice president, supply chain management, Northrop Grumman. "This agreement will allow us to help Roane's Rigging and Transfer gain additional strengths it can use to further develop its business." Based in Baltimore, Roane's Rigging and Transfer performs a wide range of business services including rigging, office relocation, crane service, hauling, demolition, welding and warehousing. The company has been a supplier to Northrop Grumman for more than 20 years. Founded in 1967, Roane's Rigging and Transfer qualifies under federal government criteria as a women-owned small business and as a small disadvantaged business. Under the two-year agreement, Northrop Grumman, as the mentor, will help Roane's Rigging and Transfer utilize tools to improve customer satisfaction and efficiency, including the use of customer surveys. Northrop Grumman will also offer its acumen in developing business plans, creating winning proposals and navigating the landscape of requirements for successful federal government contracting, including dealing with DOD regulations. Northrop Grumman has mentored more than 100 small businesses through the DOD Mentor-Protégé Program since 1992. The company has an extensive track record in supporting small business concerns including small disadvantaged business, women-owned small business, veteran-owned small business, service disabled veteran-owned small business, HUBZone small business, and historically black colleges and universities and minority institutions.